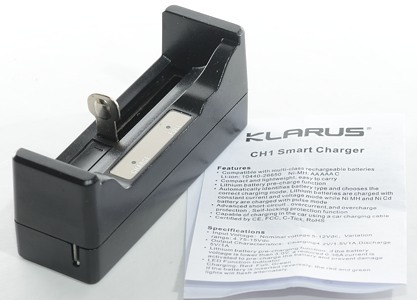 Klarus is mostly known for their flashlights, but they do also sell some chargers. Here I am looking at a small single cell usb powered charger that can handle both NiMH and LiIon, it can also work as a power bank. I got the charger in a retail box from a ebay dealer. The box only contained the charger and a instruction sheet, there was no cables. 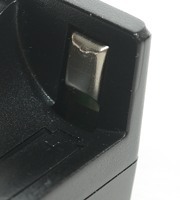 The charger has two usb connectors, the small (micro) is for power input. It is possible to feed the charger with either 5 volt or 12 volt DC. I do not really like using a usb connector for 12V, if I by accident plug that into anything else it will be killed. A DC barrel connector would have been better for 12V, but is not nearly as convenient for 5 volt usb input. I.e. to be perfect it would need two connectors and a circuit to prevent power running from one connector to the other, this is probably not realistic in this small low cost charger. 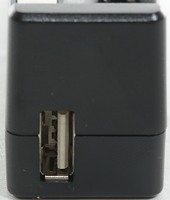 The full size usb connector is for usb power output when it is used as a power bank. There is a blue led hidden inside the connector, it will be on when there is power available on the connector. The charger has two more leds, both placed on this panel. A red one to indicate charge and a green one to indicate full. I wonder why the blue usb led could not be on this panel also. The label on the bottom of the charger is not correct. Input as marked as 5-1.2V (It is 5-12V). The charger is also rated to handle 10440 cells with 1A charge current, this is not a good idea. 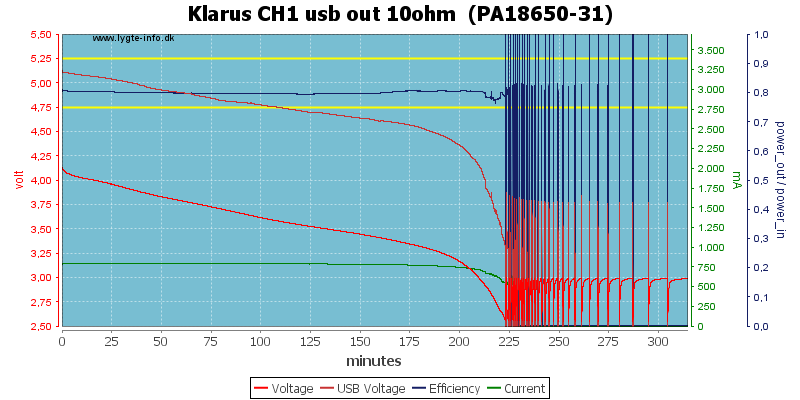 The usb output (Discharge) is supposed to deliver 1A, this is very optimistic. 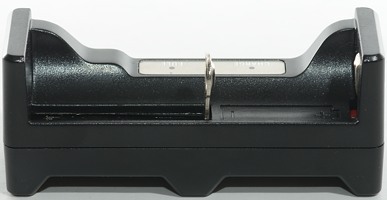 The charge uses the typical slider construction with a metal rail and it works fairly well from about 31mm to 69mm, i.e. 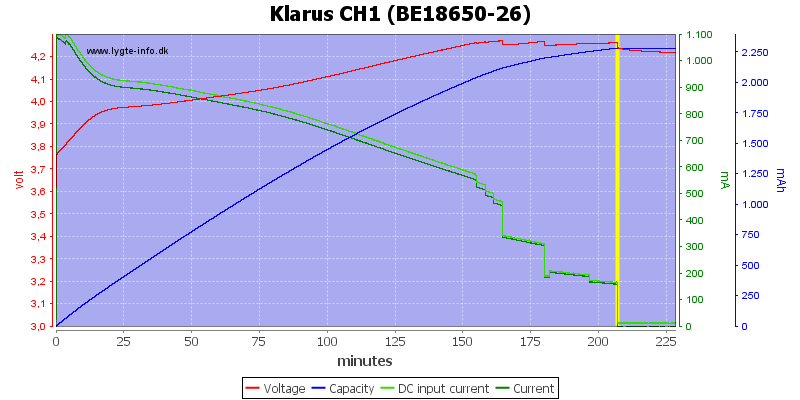 the charger cannot handle very long 18650 and 26650 cells. The construction does not hold the cells very secure, as long as the charger is used on a stable surface this mostly works, but a rubber band is needed to make this a portable power bank. 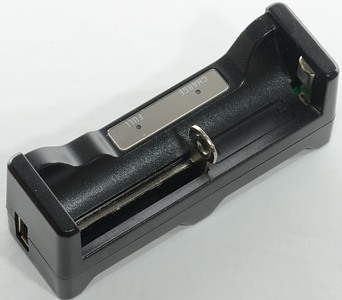 The charger can handle 69 mm long batteries, including flat top cells. The charger is always charging with 1A, this is not very good for smaller LiIon cells. 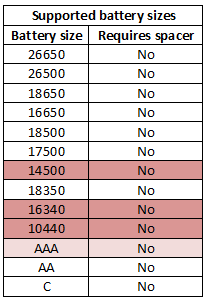 Quality AAA cells will not have a problem with 1A charge current, but it is above the rated charge current. Above 0.2 volt regular charge will be applied. Assumes LiIon when battery voltage is above 2.3 volt. Will charge LiIon with 0.38A below 3 volt and 1A above. Will not resume LiIon charge if battery voltage drops. 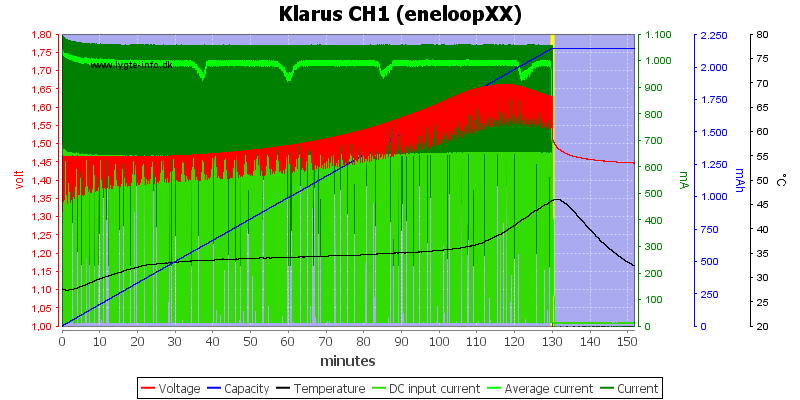 Will restart charging if power is cycled or battery is reinserted. During the first voltage check the full led will flash shortly. This curve is not a true CC/CV curve, but is fine. The charger cannot maintain full charge current when the battery voltage is high. The termination current is a bit on the high side with 200mA. I do not like that the charge voltage is at the upper limit (or slightly above) for LiIon. The two other cells works the same way. 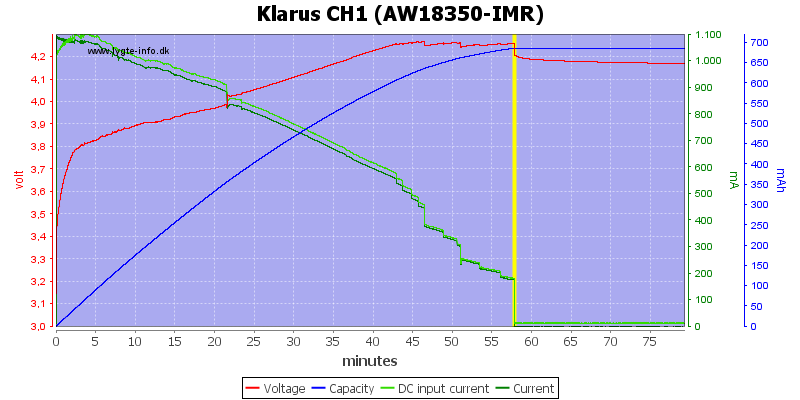 The charger also uses 1A current with short cells, this is to much for many small cells. 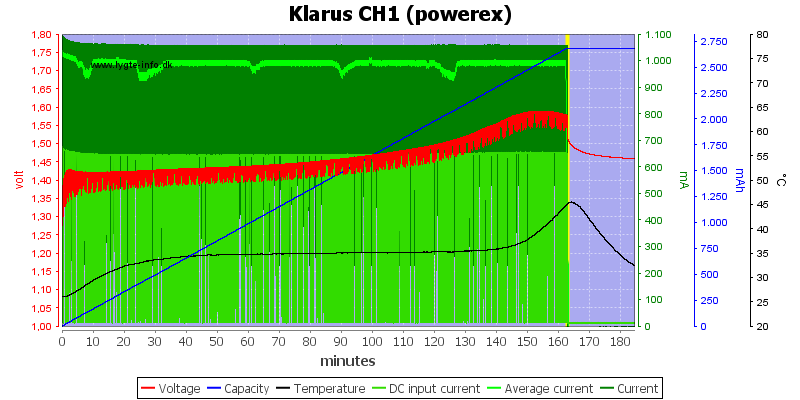 Simulating a weak usb power adapter did not give any problems, except a longer charge time. 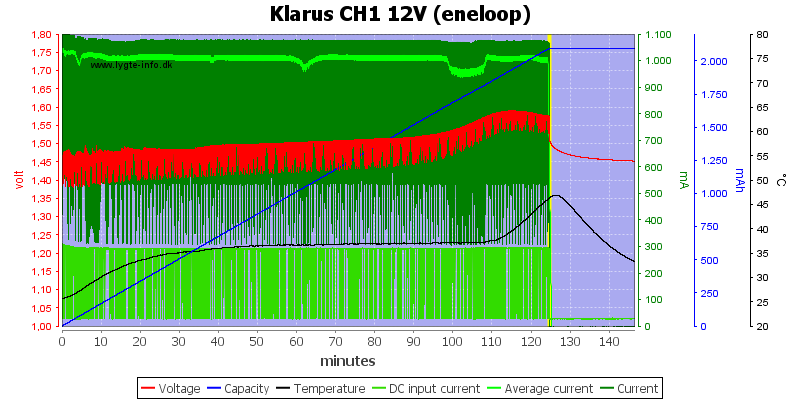 When using a 12V power supply the curve is a CC/CV curve. The battery does also get slightly warmer. 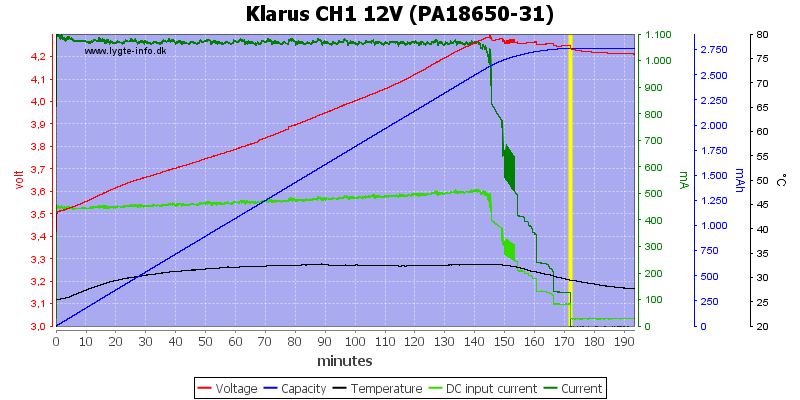 The voltage is very close to 4.3 volt during charge. 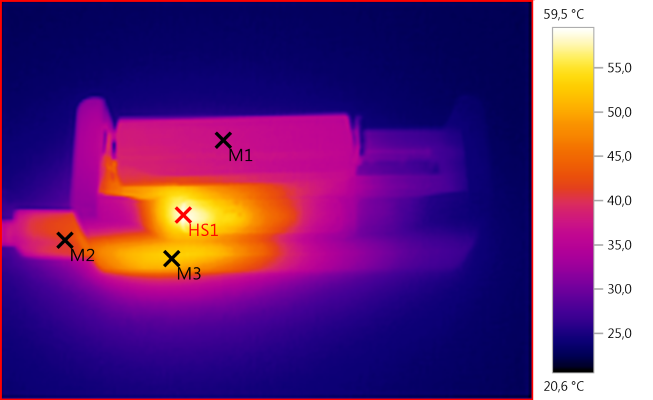 Initially when charging with 1A the charger do get warm, but later on the temperature will drop. I expect that it will stay high with 12V supply, but I did not test it. The charger needs about one second to start. The voltage check is only done once on LiIon. 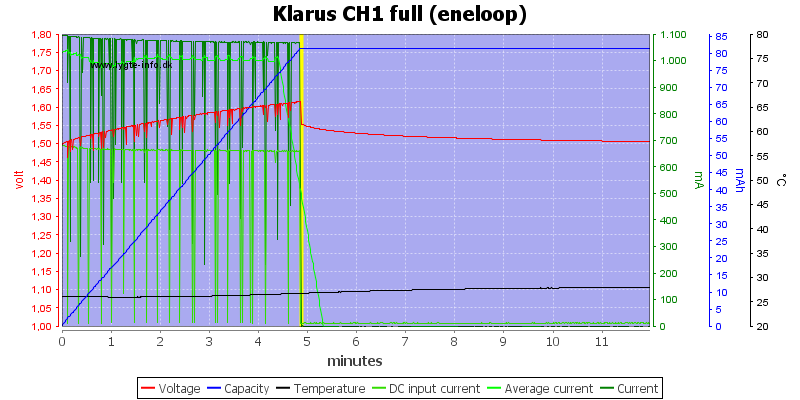 The curve looks like it terminated a bit early, but the temperature says the battery is full. 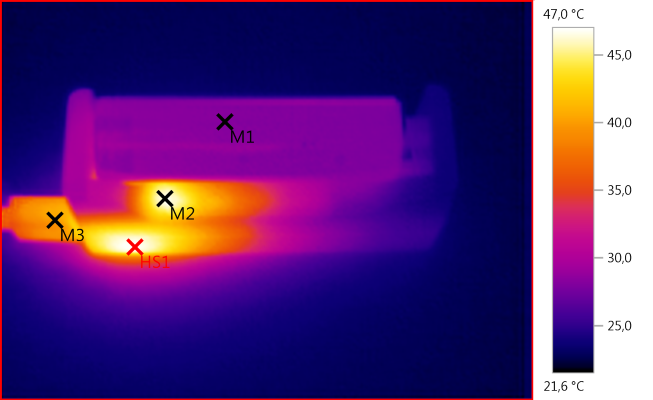 These looks like -dv/dt, the charger need about 10 minutes to detect it, giving the cell ample time to warm up. 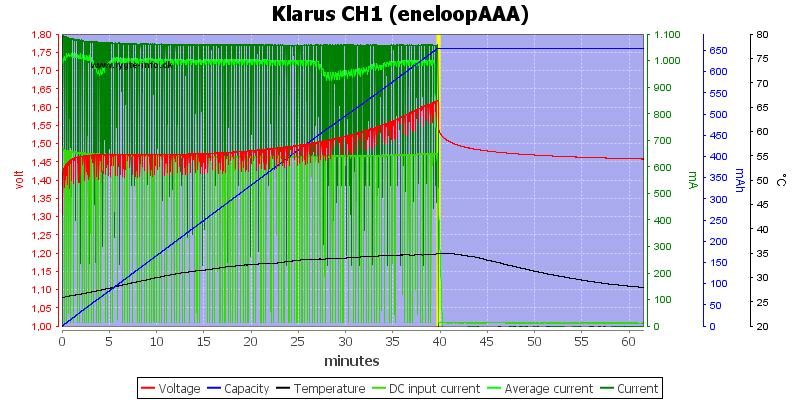 It looks like the charger stops premature on this AAA cell and the current is rather high (as expected). Detecting a full cell in 5 minutes it acceptable. 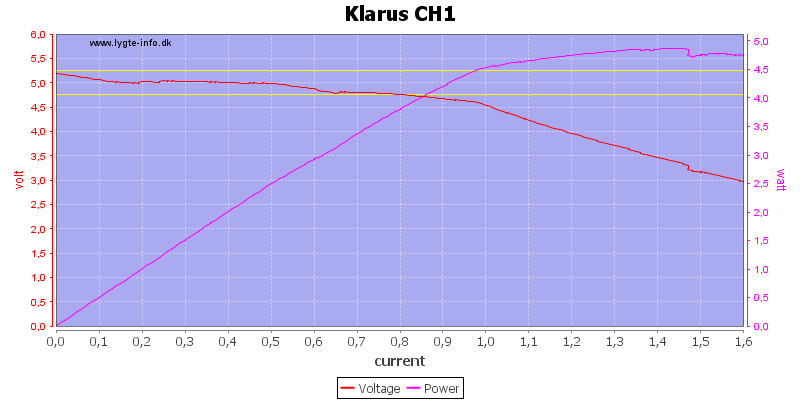 My simulated weak charger do not even affect the charger curve. There is not much difference between 5V and 12V power supply for charging a NiMH cell. With NiMH the temperature is warm during the full charge. 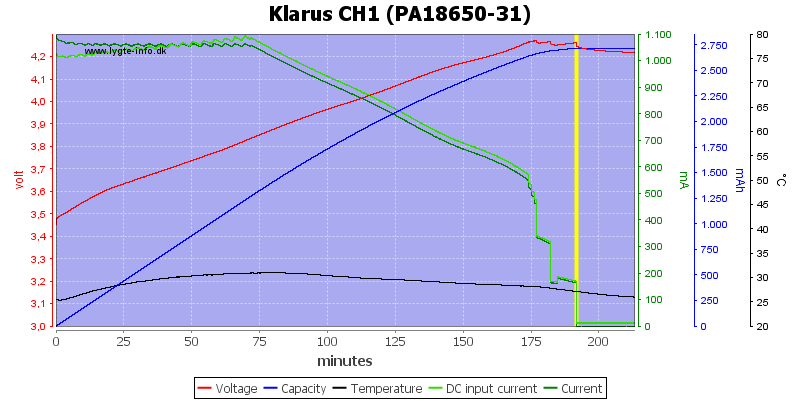 With NiMH the charger need about 1 second to start and will do voltage checks regulary during the full charge. USB output is on while a charged LiIon battery is present and no power is connected to the input usb. When usb output is on a blue led inside the usb output connector is lit. When unloaded USB output will drain the battery with 2mA. The first test is, as always, a load sweep. It looks like it can do 0.5A fine, but not 1A. There is no overload protection, I can draw 1.6A! Lets see how it does with 10ohm load (At 5 volt it is 0.5A). It maintains a useable output voltage for about two hours, then it cannot maintain it anymore. When the battery is empty it turns off, but turns on again because the battery voltage raises, this is repeated many times. It is not the best solution. It drains the battery to about 2.55 volt, this means that you have to be careful with what LiIon batteries are used for the power bank function. 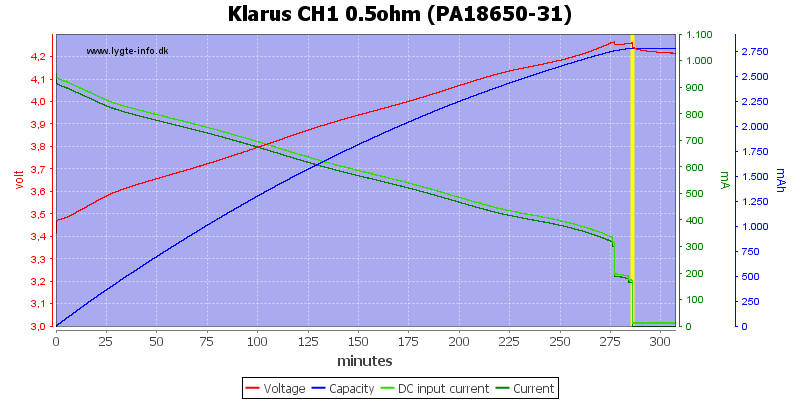 Lets increase the load, this would usual be a 1A test, but the output never reach 5V or 1A, it cannot deliver that much power. 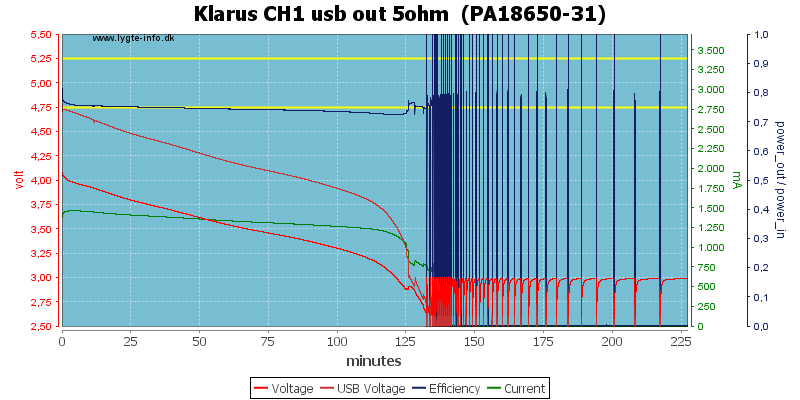 As a charger it does a fair job, but I am slightly worried about the high charge voltage for LiIon. And only charge batteries that can take the 1A charge current! 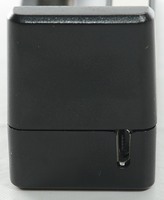 The usb output can be used, but it is rather weak and voltage drops before the battery is empty. Except for the high charging voltage I will call it acceptable.